This post & video demonstrates the basic workflow and makes recommendations for organization. Check out the new Hype Export scripts to see some advanced workflows for creating ads with the help of custom scripts. If your Hype document doesn’t appear, double check that your browser is not blocking ads via plugins or extensions. A click tag is typically a variable like %%CLICK_UNESCAPED%% that is replaced by an ad server when a viewer loads your ad. It’s quick & easy to add these click tags in such a way that they can be replaced outside of Hype, and then used anywhere within your animation. 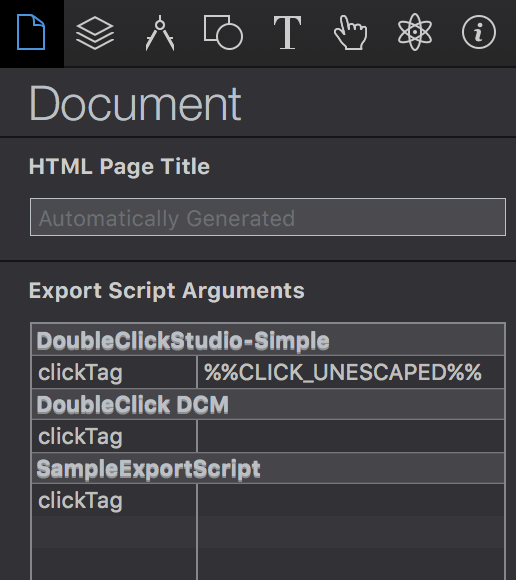 Please note that if you are using the Double Click Studio or Double Click DCM Export Scripts, your workflow is a bit quicker: the field in the Document inspector can accept either a variable or URL (also sometimes known as an Exit Override). '_blank' // <- This could be _self to open in the same window. Keep in mind that you may need to add your ad network’s library before this function. What this does it creates a function which web browsers (and your ad network) runs first before anything else, and adds the function name clickURLTriggered() to the namespace. You can now run this function from anywhere within Hype. Simply run clickURLTriggered() (perhaps in response to a ‘mouse click’ action) and this can serve as your ‘exit’. Ad networks vary on this method, but this basic premise holds true: Establish them in the <head> and then you can access them as a function anywhere else within Hype. You can build multiple banner sizes in a single Hype document, and take advantage of slice export to export multiple HTML files in one go. Crazy, right? Choose different scene sizes based on your ad sizes, and select File > Advanced Export. 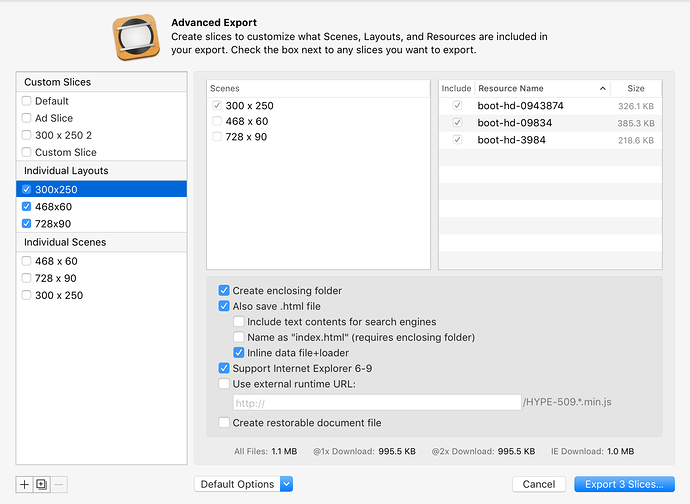 Read complete documentation on advanced export. Tip: Use scene sizes as your scene names. View our best practices for Google Adwords. There are two variations of Double Click: Double Click for Publishers and Double Click Studio. Html5 for google (step by step)? Transitioning to Hype, some questions! How do I Save my Hype Project to be optimized for Google Ads?